There are so many fantastic granite and concrete countertops available which makes it very difficult for homeowners to choose the best countertops in Tampa Bay for their home. Before you jump into the buying process, it is always essential to consider your budget and how your kitchen countertop would be used. Concrete and granite countertops come in a variety of size, shape and colors. Although both of the materials are used for the same purpose but both differ in their properties, size, cost and appearance. Therefore, we have tried to provide a brief comparison between both the materials which will help you understand why granite countertops are better than concrete countertops in Tampa. Granite: Granite is a rock formed by liquid magma that cools and solidifies and it is mainly composed of quartz and feldspar along with the mixture of other minerals. The quartz and feldspar give granite a beautiful light color that ranges from pinkish to white. This light color is perfectly punctuated by darker accessory minerals which gives classic granite the “salt & pepper” look. It has countless different color and pattern options and no slab will ever be the same as another, making each project truly unique. 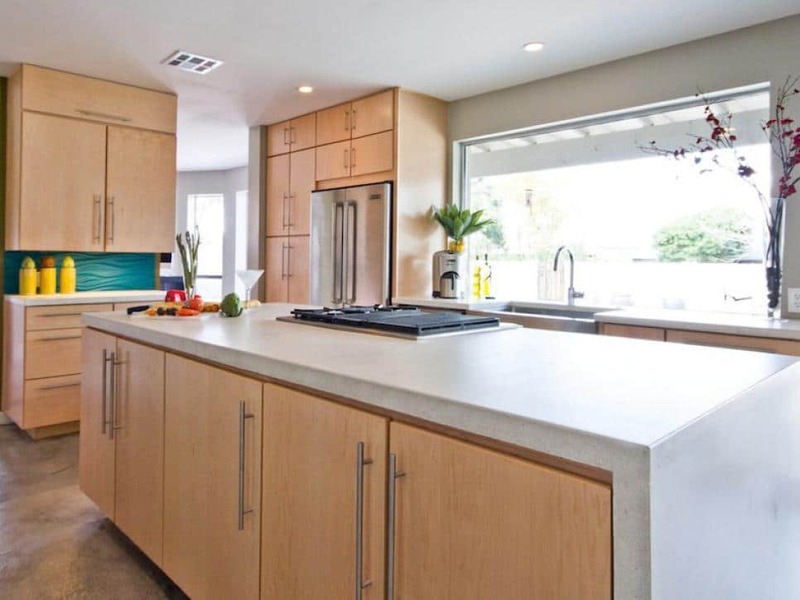 Concrete: Concrete countertops are constructed from general-purpose mortar mix i.e. 1/4 cement and 3/4 sand. In order for these counters to look more visually attractive than standard concrete sidewalks, some additional colors are used. Concrete provides an interesting industrial look with wide variety of color and pattern. For adding more grace and beauty to the countertops, colored glass or seashells can be embedded in the slab which will increase your decorating options. Granite gives you a luxurious look and it is also known as rich man’s slab. Each piece is going to be original depending upon the mineral that are extracted naturally. Whereas, concrete gives a rustic and vintage appeal and looks more like an industrial kitchen or ultra-modern space. Concrete does not give elegance but rather a minimalistic appearance. Concrete countertops may look like massive slabs but in fact, they are only 11/2 to 2 inches thick. The reason why the slab looks much thicker is the drop-front edging on the countertop. But still they are very heavy and installers sometime need to reinforce the cabinetry, and sometimes ever floor in order to bear the weight. Concrete countertops are sometimes formed and poured on-site but mostly a technician will take precise measurements of the space and then fabricates it in the shop and same is the case for granite countertops. After completion the countertop is delivered to your home and then installed. During installation the crew may build or install support frames for sinks as it is essential for the countertop not to carry the weight of the sink itself. After being carefully leveled and shimmed, countertop is adhered with construction adhesives. Everyone who cooks is worried about scratches. As far as strength and durability is concerned, there is no clear winner. Both of the materials are strong enough to handle every culinary activity you throw at them but it is always good to be a little careful. In terms of maintenance, granite might be the better option. Concrete is porous so it is more prone to staining than granite. This is the reason why concrete needs to be sealed more often as compared to granite. The actual cost of a concrete top is not because of the material itself, but because of the time spent in creating unique shapes, designs, transportation and installation. On the other hand, granite is also not famous for its small price tag either. Both of the materials are going to cost anywhere between $30 to $250 per square foot installed. Depending on the materials, edging, cutouts, styling, etc. Concrete countertops can be easily scratched. A single knife cut would be enough to cause an easy scratch on it. On the other hand, Granite is scratch resistant. This stone can virtually resist anything, only granite itself and diamond has the capability to cut granite. A property that is a must in all the countertops is heat resistance. The reason is that there are all sorts of hot pans and pots in the kitchen which a countertop must be able to withstand. Granite is heat resistant and you will not have any problem in placing all your hot pots and pans on the surface as it will not receive any damage. Concrete is also heat resistant but it is sealed to avoid cracks which is likely to get damaged in case you plan to put hot pans or pots, so, you will have to put a heating pad on the surface. 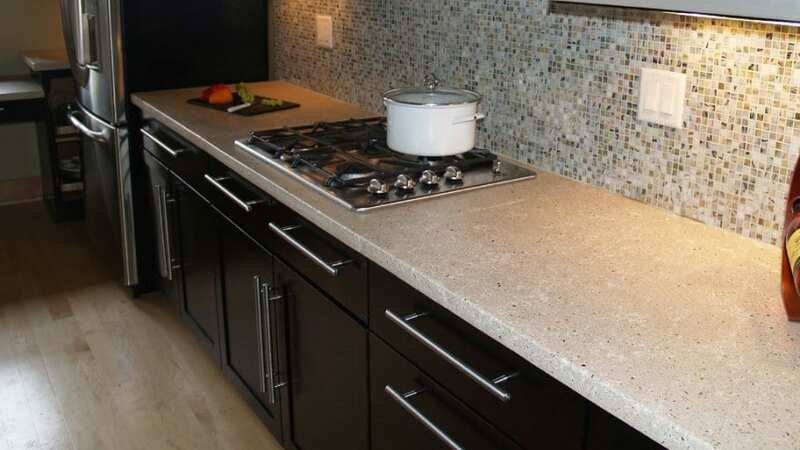 Granite requires very low maintenance as it is non-porous in nature and does not require any sealing to prevent solvent from penetrating in the countertop. However, we recommend you to get your granite countertop sealed once after the installation in order make it more durable and increase its lifespan. Concrete on the other hand is porous in nature which allows liquids to penetrate and also promote bacterial and mold growth. In order to maintain your concrete countertops, you must get them sealed at the installation and then every 1 to 2 years, plus you need to get it waxed every month so that it does not experience any damage. Which One Is Right for You, Granite or Concrete Countertops? So, this was about everything you need to know about granite and concrete countertops. Now the decision depends largely on what you see as attractive or what you truly want in your home based on your taste. If you want more information about what would be the best material for your home, then visit our showroom in Largo or request an online consultation through our website. Our countertop expects will get back to you with all the details or can arrange a time to discuss.